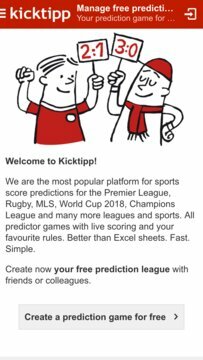 The mobile app for Kicktipp. 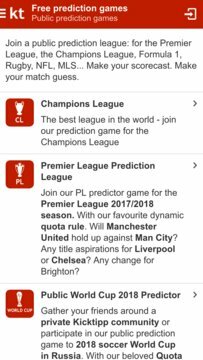 Look on the move in your prediction game and enter your tips for your own prediction game like Bundesliga or Formula 1. Track your placement with LIVE scores in the Betting overview. Add your own league and bet with friends on your local city teams across all sports. This is Kicktipp. Tell us how you like it. Send an e-Mail to service@kicktipp.de.